Overall clean and nice, hardly read. One page at back of book has a written note. Includes the rarely seen dust jacket which has a few small edge chips. This copy is autographed by the author. This book is a collection of newspaper columns by the author (who was originally from New England) who in a whimsical way, describes her impressions of living in Newton County, Arkansas. 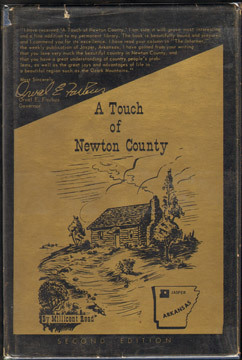 From the forward: "This little book contains thoughts, facts, and dreams of Newton County, who, with her people, give beauty, peace, happiness and contentment unexcelled. It is written with the hope that it will scatter a Newton County welcome in such a way that it's readers cannot resist knowing and loving her does the author.."
This book does not include history or genealogy.